My grandma's secret recipe to make this chicken so rich is to boil the chicken forever! You can use any chicken pieces you prefer - I use four large chicken breasts. Dark meat adds more flavor but more calories as well. Put 4 cups of water on to boil. In the meantime chop vegetables and rinse and clean the chicken breasts. Add vegetables and chicken to the boiling water. Be sure to replace water as it boils off. After 2 hours (or longer -- boil as long as you can) take out the chicken, remove the bones and skin and discard, and cut into large chunks. Return the cut up chicken to the soup. 30 minutes before serving add the matzah balls. For the matzah balls - Whisk together yolks, salt, pepper, parsley, schmaltz and water. Whip egg whites until stiff and fold into yolk mixture. Refrigerate matzah ball mix for at least 3 hours. 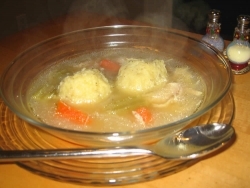 With oily or wet hands form matzah balls and drop in boiling soup. Drop matzah balls into boiling soup, lower flame to simmer and cover for 30 minutes. We make this soup in large batches and it is great every time! great issues altogether, you just won a brand new reader. What might you recommend in regards to your publish that you simply made some days in the past? Any certain?